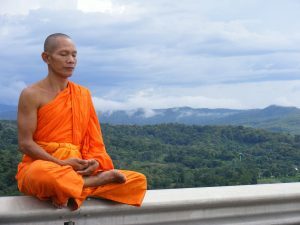 There’s an interesting book that just came out called The Art of Stillness by Pico Ayer, the renown travel writer, describing the inner journey. I can think of no better book for the golfing aficionado, even though there is not one mention of the most interesting game in the world. But to approach golf, you must experience a state of “No Thinking”, promulgated by the late, great Korean Zen master Seung Sahn. Having done retreats with him in New England years ago, he would point his finger, saying, “Only go straight,” and punctuate his talks with reminders of “No thinking,” to emphasize the need to stay in the present moment, and avoiding the judging mind that can so easily catapult you out of that sacred present. The quest for enlightenment is a rigorous one, requiring physical and mental stillness in the quest for self-knowledge. Soen sa Nim, as he was called, never mentioned golf as a training ground, but a prerequisite to an effective and reliable golf swing and putting stroke is stillness: of head and thought. Here is another example as to how golf can be part of a meditation practice. In fact, if you’ve ever meditated, you will notice that a fundamental to a clear mind is a still head. In golf, a relatively still head, throughout the swing, leads to that deep stillness that promotes the swing staying consistently on plane. Go ahead and experiment with this. You will find that a head that drifts horizontally or vertically during the swing will lead to leakage in distance and accuracy. For a wayward head is the forerunner to a core that leaves the center post of the swing. And once the core leaves that center post, the arms try to compensate by separating from the core and going beyond the limits of the core’s rotational capacity. John Daly’s swing is a picture of power but by taking the club back beyond the turning limits of his core, he has been one of the most inconsistent majors-winning players in the history of the game. Although, I must say, John does have tremendous flexibility, along with great hands and wrists. So there are several key positions to check when monitoring head position. First is during the key move just when the arms and shoulders start the backswing. The head here can have a tendency to move horizontally to the right, and even a slight movement can affect the one-piece takeaway that’s needed to maintain the swing’s integrity. So in the first 15 inches of movement of the arms, hips, and shoulders, the head should not move at all. You can easily check this in a mirror. Then, at the top of the backswing, the left shoulder touches the chin, and the head again is in the same position as it was at address. It should be fairly easy to keep the head still up to that point since this move is rather slow. But as a pitcher’s throw following his windup, now starts the real action in golf. Increasingly, the downswing gains in speed, until, at impact, the clubhead is going a bit more or a bit less than 90 miles per hour. And the head should be in about the same position as impact. In my situation, I’ve noticed if it moves forward at that point, the clubhead is slightly open and ball slices to the right. If the head moves back to the right at impact, the clubhead is more closed and a pull hook can result. Now with a clubhead moving at such speeds, it’s a challenge to keep the head still, especially as one gets older and less flexible. What I’ve been trying to do is to shorten the backswing some and work towards making better contact with the sweet spot of the clubface. I was playing with a fellow yesterday who did just that, and though he didn’t hit it particularly far, the sound of the ball off the face was cracking sweet. And he was mostly in the fairway. We were playing the fairly tight and difficult Bennett Valley in Santa Rosa, but my companion didn’t think the course was difficult at all. He’d only been playing the game for four years, probably aged around 60, and he kept his backswing relatively short and his head steady as he came through the ball. I loved that sound he made with the driver, in particular. You could tell immediately that the shot would be successful. So your challenge on the range is to find a swing that will stand up to the pressure and tension of course conditions. A steady head and mind. A connected, measured, and grooved swing. A contained backswing. These are basic elements. But each of you has a different body, mind, and disposition at the first tee. There is no easy cookie-cutter approach to this daunting game. But a dose of deep stillness will set a good foundation. I dare say, Tiger Woods, who was raised a Buddhist by his Thai mother, could use a good bit of it at this point, after his horrendous third round at Jack’s Memorial. 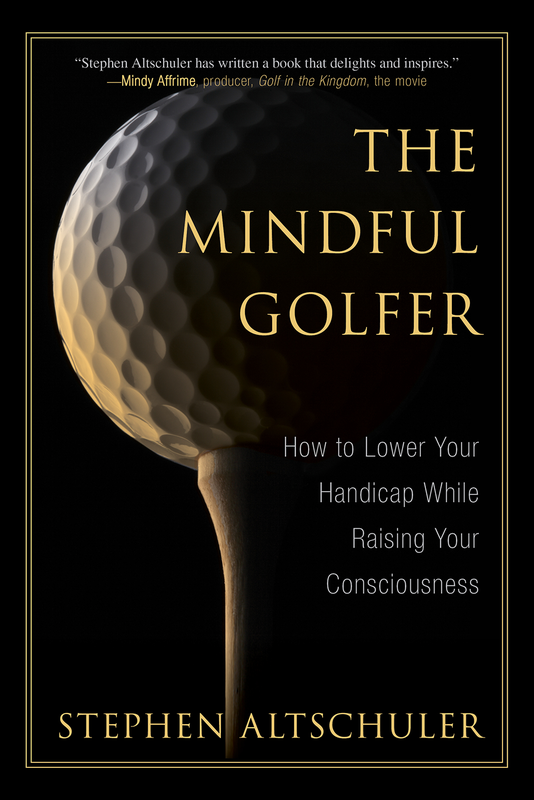 The publication date for my new book, The Mindful Golfer: How to Lower Your Handicap While Raising Your Consciousness (Skyhorse Publishing, New York NY) is June 23, 2015. You can pre-order the book at Amazon.com or through your local bookseller. Or you can join me for readings/signings posted on my Events page, and be among the first on your block to purchase a copy. Hope to see you if you’re in these areas. Thanks so much, Jim. I’d forgotten Watson’s mantra. It’s a good one to remember. As always, I appreciate your taking the time to comment. You could then argue that for a high handicapper to get his head in the position that most tour pros exhibit at the top of the backswing its got to move a lot! Of course, Graham, we would need to distinguish between irons and drivers–the head being a bit more back of the ball at address with driver, and a bit on line or forward of the ball with irons. It’s at impact, for both irons and drivers, where the pros separate themselves from high handicappers. For pros, the head is pretty much where it was at address. But with handicappers it’s often off the mark at impact, causing problems with how the club face meets the ball. At least that’s how I see it. I see the golf action as more throwing than hitting ie a baseball batters body action with pitchers arms! So the batter could be seen as throwing the bat at the pitcher or more accurately the ball is stuck with gum on the bat and hes throwing it at the pitcher. I know your strong on visualization and Ive never seen that weird analogy used before!